Meals that Ella served were simple “comfort food,” and also reflected the Eggers’ German heritage. Kuchen, gritzewurst and kock kase would have been staples at breakfast along with coffee, eggs and home baked bread. Ella procured ingredients from her own garden and larder and supplemented with food traded at the store from nearby farms. 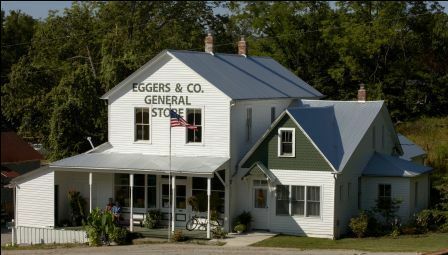 Today’s popular buzzwords: “local,” “sustainable,” “fair trade,” were the Eggers way of doing business decades ago. “Gritzewurst,” or oatmeal sausage is made by locally owned M & M Meats. “Kock Kase” means, “cooked cheese,” and is a creamy spread for home baked bread. Apple butter and jams were always on Ella’s table. “Kuchen” is the German coffee cake that is still makes an appearance at every church function. Ella’s kitchen even had a “kuchen schrunk,” a cabinet specially outfitted with shelves to store her weekly kuchen baking. The yeast dough is rolled out onto large flat pans and topped with seasonal fruit, crumbs or peanut butter frosting, then sliced into narrow strips, perfect for dunking in your coffee. Seasonal fruits and egg dishes prepared from locally produced eggs make breakfast at Eggers and Company a full meal. Please let us know if you have any dietary considerations. Alternatives to our signature menu can be offered. A full breakfast will be served in the dining room at a mutually agreed time.